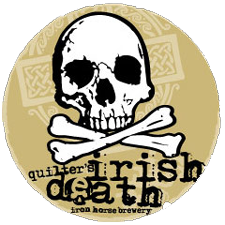 Quilter’s Irish Death from Iron Horse Brewery attracted me with its bottle design. Who wouldn’t want to drink a local dark beer with a skull on it? It’s touted as a dark, smooth ale. The flavor is good, but when I opened the bottle, it was flat. I purchased it less than a week earlier at a Safeway. (have I mentioned Washington now has beer and liquor in its grocery stores? YAY) There were a few tiny bubbles but only after I poured it as roughly as I could into a glass – no head at all. It was just flat. My question: is it supposed to be that way? I would imagine not. Any experience with it?